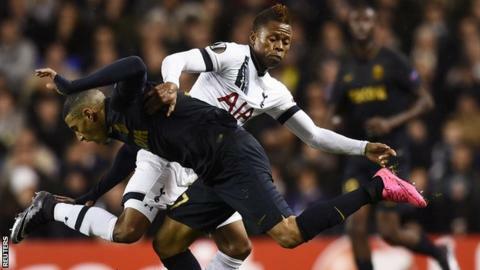 Tottenham striker Clinton Njie has been ruled out for two to three months with a knee injury. Njie, 22, had surgery after sustaining the injury in the Europa League win over Monaco earlier this month. "I don't know [how long he will be out] but we expect maybe two months or two and a half," manager Mauricio Pochettino said. Cameroon international Njie joined from Lyon in the summer but is yet to start or score in the Premier League. The news leaves Tottenham short of attacking options, with Harry Kane the sole recognised centre forward and Son Heung-min and Nacer Chadli now the only other available players who can play up front. However, midfielder Ryan Mason and defender Danny Rose are back in contention for the home game against Norwich on 26 December after injury and illness respectively.